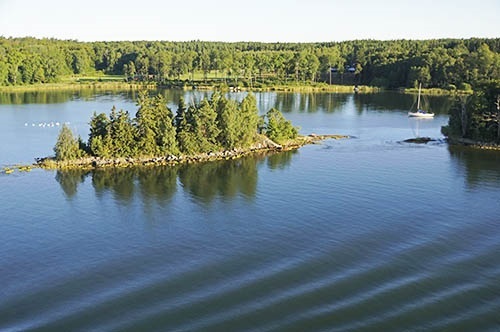 ABOARD THE EURODAM – Following a time change coming from Finland, our ship is gliding on the placid waters of the Baltic this morning past hundreds of small forested islands. As dawn breaks only a smattering of summer cottages with a boat dock can be discerned among the trees on most. 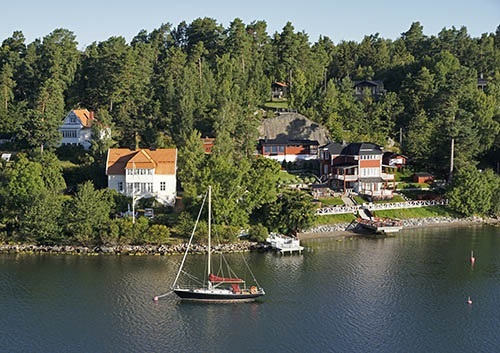 Even more infrequently, we pass a tiny village with a marina in the wake of our ship. The sun rose at 4:35 AM to begin a picture perfect day and arrival in Stockholm is not until ten o’clock. There’s ample time to enjoy the passing scenery and to reflect upon the pleasures of cruising while having a leisurely room service breakfast in the fresh sea air on our stateroom balcony. An island village on the Swedish coast. 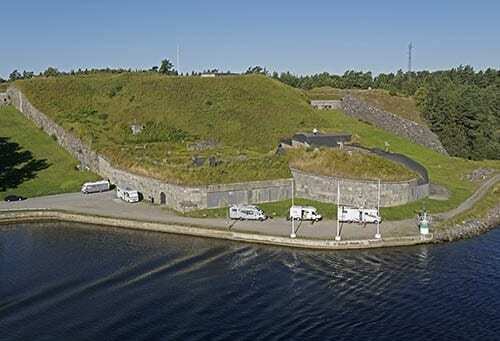 For North Americans the vegetation and rocky outcroppings on the Swedish coast may be reminiscent of the upper Great Lakes, the Thousand Islands of the St. Lawrence or even Lake Tahoe. With one quarter as much salt content as the average ocean, the Baltic Sea’s ecology is in some respects unique in that the shores are more like those of inland lakes. The weather for the past week has been ideal. Sunny, with perfectly clear or nearly cloudless pristine blue skies daily and temperatures in the 70s have become routine. And the sunsets seem to get better every evening. 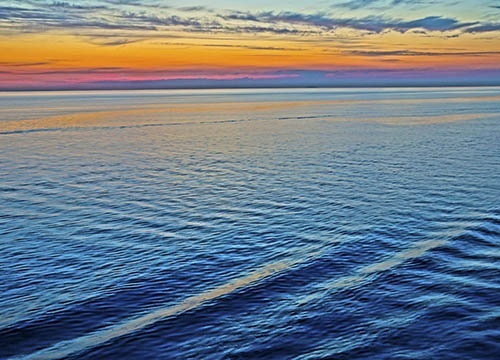 What cruiser, novice or veteran, doesn’t go gaga over a brilliant sunset at sea? An old fortification that guarded the entrance to Stockholm harbor. As the Eurodam approaches ever closer to port, more development and economic activity is evident. An old fortress for guarding the approach to the city is passed and many of the shoreline cottages become more substantial, some even defying the description of a cottage. Soon the suburban spread of Stockholm has enveloped the landscape in all directions. A Swedish company that hunts for lost treasure and shipwrecks, Ocean X Team, recently found a Russian submarine lying on the sea floor just off the Swedish coast. The Swedish Armed Forces, always on the lookout for intruding foreign vessels, was quickly alerted. It was soon determined that the sub had been part of the Imperial Russian Navy and sank in 1916 after striking another vessel during World War I. The tsarist era crew of 18 had been missing in action for 99 years and the mystery of its disappearance had finally been solved. What other mysteries lurk in the deep in the Baltic waiting to be discovered? A UFO perhaps? A mysterious Baltic Sea anomaly found by sonar in 2011 became the subject of just such a wild rumor. Many people speculated, based only on a single blurry image, that the mysterious object could possibly be a “1,400 year old UFO, a portal into another world, or an underwater Stonehenge.” Our ship passed over the location of the finding in the night, so unfortunately I couldn’t get a good look. 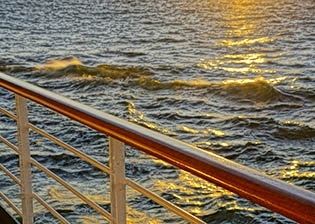 Sunset on waves in Baltic Sea from Eurodam cruise ship. On a more serious note, the pristine appearance of the Baltic belies the pollutants, including thousands of tons of chemical weapons dumped into the sea following World War II and some 23,000 barrels of mercury recently found on the sea floor off the coast of Sweden. The sad fact is, that despite it’s appearance, the Baltic Sea is sick. “The Baltic Sea is one of the most polluted seas in the world” according to Baltic Sea habitat experts. Unless a new nine border-nation and EU pollution control plan is successful some of the secrets hidden deep in the Baltic may ultimately prove disastrous to fishing, shipping, recreation, and perhaps to us happy cruisers as well.